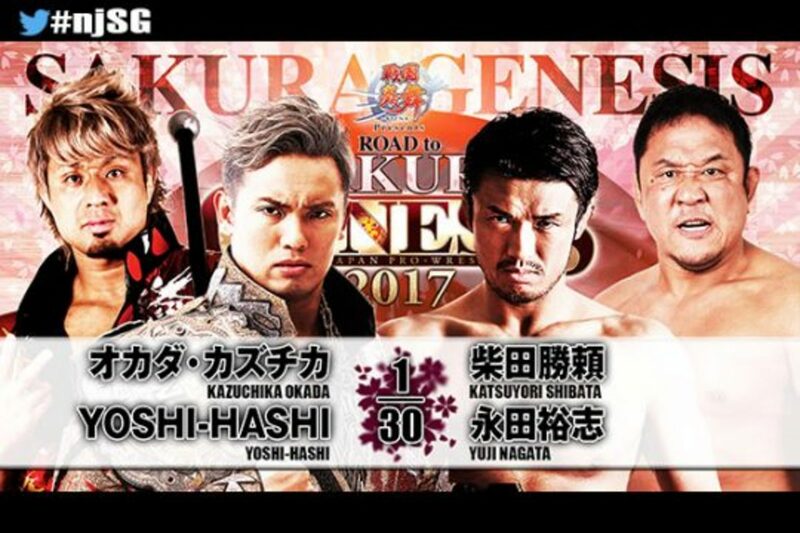 Kazuchika Okada and Katsuyori Shibata started their build towards Sakura Genesis by competing in tag action. Shibata scored the win for his team, giving him the upper hand heading into the April 9th event. Fale got his heat back from the New Japan Cup loss quickly, pinning Oka with the Grenade. Kawato jumped in immediately but was dominated by the heels as they worked him over. Tiger Mask came in to clear house and landed the Tiger Driver on Taka. Liger and Desperado brawled to the outside where Liger blasted him with a chair. Kawato was in and he and Desperado had a pretty good back and forth. Taka flattened him with a kick, and Desperado soon followed with the Guitarra de Angel. This was a good match, especially towards the end. Kawato is really good at showing off the young lion intensity. This turned into a good back-and-forth match. War Machine never have an off day and looked really good here. Hanson tried to take out Makabe with a suicide dive but instead hit Ray Rowe, taking them both out. Finlay was left in the ring with Kojima, and soon enough the leader of the Bread Club picked up the win with a lariat. This was an okay brawl between the two teams. Taichi got the heat on Jado after striking him with his microphone. Goto and Suzuki went at it and had some good action. Kanemaru was tagged in, as well as Gedo, who went for the Gedo clutch, but it was broken up. Gedo had the advantage but Suzuki grabbed him. Goto cleared Suzuki out of the ring, but Taichi came in and hit Gedo with one of the IWGP Jr. tag belts after missing with the mic stand. Kanemaru followed with the pinfall after the DDT off the top rope. Omega worked a lot of the match, which was fine but nothing special. Ishii and Omega had their exchange, which was okay. Omega and Yano did comedy together. Owens came in and avoided the exposed turnbuckle by Yano, but still got caught up in the funny business, being pushed into the ref, low blowed, then blasted with a lariat as Yano rolled him up for the win. This also was pretty good; nothing revolutionary but everyone got to work together. Tanahashi was going for the High Fly Flow when EVIL shoved the ref into the ropes, crotching him. It boiled down to Juice and SANADA. The latter was going for the Skull End when everyone came in and did brief flurries of offense. Juice transitioned out of the Skull End and instead landed the Pulp Friction for the win. LIJ immediately jumped Juice after the bell, with Naito putting the boots to him and the rest of his tag team partners. Okada and Shibata started things off, but were tentative with one another as they tagged in their partners. Okada and Nagata were in, and at one point when Okada had Nagata laid out, he sat down and posed much like Shibata does, mocking him. This was weird in that everything looked good, the match itself wasn’t bad at all, but the crowd wasn’t as into it as you’d imagine. Nagata worked on YH’s arm until Okada broke it up. Okada went for the Rainmaker on Shibata but he transitioned to the sleeper. He was going for the penalty kick when YOSHI-HASHI attacked Shibata. He tried to land the lariat several times but Shibata countered with a hard shot and the sleeper. He took out Okada, then followed with the penalty kick for the win. The match picked up a bit towards the end, but otherwise it was just a perfectly fine match. Shibata cut a promo after it was over, calling out Okada who was on the outside. Okada walked to the ring, then he and Shibata exchanged brief words with one another as the show closed. This had nothing you need to see, honestly. Everything was well booked and built well towards Sakura Genesis, but if you’ve seen one New Japan show with just tag team matches, you’ve seen them all.